This tweaked Spider from Line 6 is an absolute triumph. Display is a tad small. 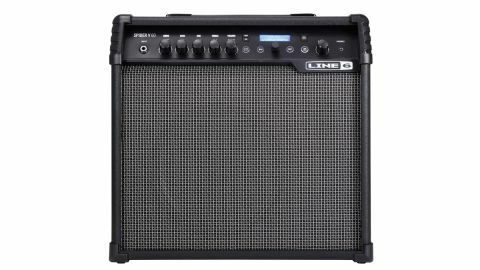 Technology never stands still; and when you're the market leader in one of the most competitive amp-building areas, you have to keep evolving, and that's what Line 6 has done with the latest update to its long-serving Spider modelling amp range. Here, we have what's likely to be one of the most popular versions, the 1x10 Spider V 60 combo. Clad in black vinyl, with a smart black and silver grille, the new Spiders have a distinctly different look. The Line 6 badge has moved from the centre to the right of the control panel, and the shiny knobs of the Spider IV have been replaced by matt black ones, with colour-coded backlit lettering, giving the new Spider a futuristic yet functional look. The Plexi and two variations on the AC30 are among the high points, organic and brimming with attitude. There's more under the skin, too, as the Spider V 60 has a bi-amped, full-range loudspeaker system, with a 10-inch custom-designed driver and a separate tweeter to make sure nothing's lost. There are over 200 high-quality amp, effects and cab models, with over 100 presets to enjoy, together with a built-in tuner, metronome and even 19 real drum loops to jam along to. As if that wasn't already enough, there are Android and iOS apps and a built-in receiver for Line 6's Relay wireless transmitters, not to mention an aux in, and a USB out that will let you record to a PC using the bundled Cubase LE software, or to your tablet or mobile phone. The Spider V's controls are intuitive, although the display is a little on the small side. The updated sounds are excellent; the new full-range speaker system means better quality at low volume and more balance at higher volume levels, and not just for electric guitars - your acoustic will sound just as good, too. As with any modelling amp, the accuracy of individual amp models is important, but what's more important is how well those core sounds and effects hang together and how responsive the amp feels when you're playing it. In this department, the new Spider scores highly - strip away the effects and the basic tones are full of character with great pick response. The Plexi and two variations on the AC30 are among the high points, organic and brimming with attitude. The preset patches are very good, too; the effects are occasionally overcooked, but as a starting point they're all worth a listen. The mobile app is easy to use, intuitive and fun, connecting without any glitches and letting you edit and save your own sounds, as well as upload them to the Line 6 cloud network and download firmware updates. The new Spider V range represents great fun for guitarists at all levels - the new and improved amp models are highly playable and represent a significant advance over the competition, while the built-in looper, metronome and drum loops make practice great fun, too. And let's not forget, fun is what it's all about!